Portraits of the 17th-19th c.
The Orthodox and Greek Catholic Church art 12th - 20th c.
Sacral art of the Roman Catholic Church 15th - 19th c.
Picturesque paintings from the 17th-19th century occupy an important place in the Historical Museum collection. Portrayed people were connected with the Sanok region due to their provenance, status and family relations. The old Polish name “konterfekt” (a present name: an effigy or a portrait) is usually limited to a head or a bust. However, it can also present some person to a waist, knees or in a full length form. Depending on the current fashion and the ideal of beauty we can find idealistic, realistic and representative portraits. The Sarmatic portrait, which shows the nobleman in an adorned dress with all accessories is very characteristic of Polish Baroque art. The portrait of this type had individual and family attributes in itself. An important element of Sarmatic portrait was its realism and decorative values. When at the end of the 17th and mainly at the 18th century magnates had built palaces, their huge chambers were decorated with the portraits of their ancestors. In this way they wanted to show the antiquity and splendour of the owner’s family, more than once thinking up various stories. The portraits were done by the painters from the guild, but also by the artists from magnats’ courts who were submissive to their patrons’ tastes. After the Second World War the museum collection of portraits was in majority taken over from the Załuski family from their palace in Iwonicz. Other paintings from the mentioned collection the Historical Museum in Sanok obtained as gifts or they were bought. 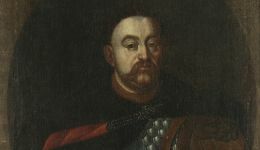 Among the 17th-century portraits the distinguishing ones are the portraits of Jan III Sobieski and some unknown man of “Ciołek”coat-of-arm, which are simultaneously the example of the Saramtic portrait. A portrait of Franciszek Sebastian Foltowicz, who was a famous counter-reformer, a senior of Dynów and a country parson in Blizne, comes from the same time. A painting of a boy holding a flower is on the high artistic level. 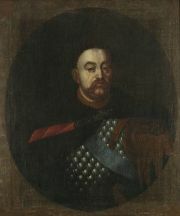 The 17th-century painting is also a portrait of Andrzej Drohojowski, who was a foreman of Sanok in 1652. In the Historical Museum in Sanok there are also paintings from the 18th century, which form the gallery of family portraits. Among them we can find effigies of Józef Andrzej Załuski (1702-1774), who was a founder of public library in Warsaw, Andrzej Stanisław Załuski (1695-1758), a bishop of Cracow, and there is a portrait of a count Józef Załuski, a general warden of Scientifics Institutes of the Free City of Cracow, at least an effigy of Amelia Załuska form the Ogiński family (19th century). 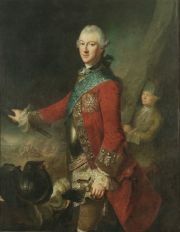 The portrait of Michał Ogiński (1768-1793), Lithuanian Crown Hetman, painted by Rossina Mathieu Lisiewska in 1755 is really remarkable. This painting was done in Dresden, where the artist worked, and Ogiński was travelling across Europe at that time. It’s worth mentioning that the second version of the painting is in the National Gallery of Paintings in Minsk. The 18th-century portraits are also an effigy of some unknown woman of “Dąbrowa” coat-of-arm, which comes from Bażanówka and once belonged to the Laskowski family of “Dąbrowa” coat-of-arm and the portraits of Bogumił and Konstancja Ustrzycki from the Siemianowski family, who were the owners of Ustrzyki. In the 1960s and 1970s the museum bought some exhibits, which were incorporated into the portrait collection. 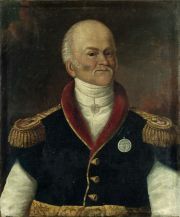 In this way the museum gained the 19th-century portraits of: Mateusz Świrski – the chamberlain of Sanok, Adam Urbański – the castelman’s worker to the military cases of Sanok and aide-de-camp general during the reign of August III, and the effigy of general Józef Załuski painted by Lviv painter Marcin Jabłoński. Ksawery Krasicki was also equated with our region, so small wonder that his portrait is exhibited in the Historical Museum collection. He was famous for the brave protection of the Sanok castle against the Austrian army in 1809. He was also a founder of an orthodox church in Lesko. 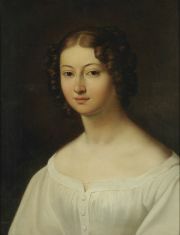 Another example of the 19th-century portrait is a painting probably done by Kazimierz Wojnakowski (1772-1812) with the effigy of Maria de Neri, a widow after Kajetan Nagórski, later a wife of Michał Ogiński. Most of works were made by anonimous artists on a various artistic level. 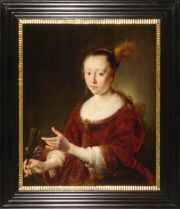 Although these works are valuable due to their historical, archival and documentary value, the most precious object in view of its unique artistic significance is a portrait of “The Lady with a fan” painted in 1650 by Gijsbert Sibilla (1598-1652), a Dutch painter, whose creation was formed under the influence of Rembrant Van Rijn. Apart from this unique work of art, in our collection there are also two paintings of Western Schools. There is: “Mourning over Christ” done by Italian painter, who signed himself as G. Pagani. As one may suppose it was Gregorio Pagani (1558-1605? ), who drew inspiration from Rubens’ drawings. The second one is some unknown painter from the 17th century, presumably a Dutch one, who painted “A quarrel in front of an inn”, the generic scene placed in a village landscape. From 27/04 to 5/05/2019, all museum exhibitions will be open from 9:00-17: 00 and the day 29/04/2019 will be a paid day. On 6/05/2019, the Historical Museum in Sanok will be closed. Portraits of the 17th " 19th c.